“Each time I have been there, there are more excavations. On the morning of June 29 Delia and I visited the wetland and met the man. His name is James, he told me where he is from and where his parents now live, which is nearby. He asked me how many times I had been there. He apologized for how dirty he was when we shook hands. When I complemented the place he was living, he said there were too many noxious weeds. I tried to get him to differentiate between the natives ferns and Salmonberry and the invasive English Ivy, but I don’t think he bought it. 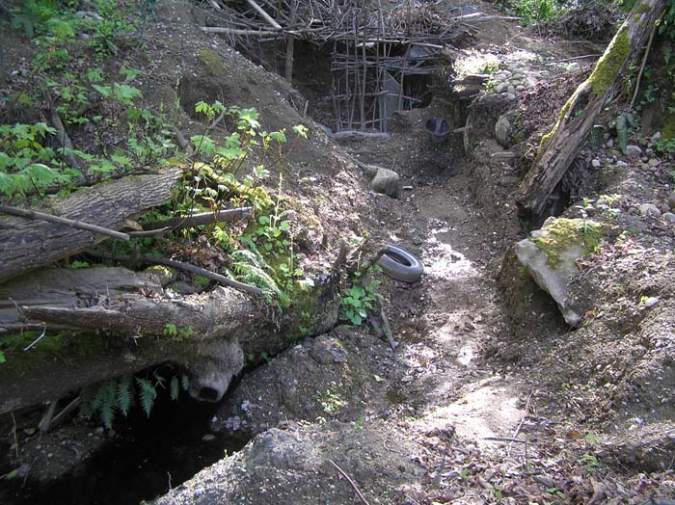 The Moleman’s work includes a cave like structure with a stick gate, an irrigation canal, a staircase, and a number of random scattered holes stretching a half-acre. Impressive as his labor may be, the city parks decided to put an end to his habitat-damaging digs. However, when they went to evict the man from his woodland hollow with a no-tresspass order, he was nowhere to be found. The man has reportedly been asked by park staff to leave multiple times, but continues to return. The city says the work to fill the holes created by the Moleman, “could cost taxpayers tens of thousands of dollars,” according to CBS.